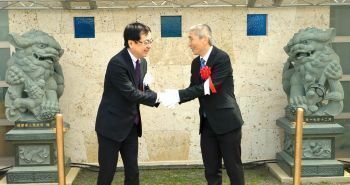 Takao Kadekaru (left), head of the Okinawa prefectural government’s Department of Culture, Tourism and Sports, shakes hands with Hong Li, vice director of the Foreign Affairs Office of the Fujian Provincial People’s Government in front of the lion statues after their unveiling on March 11 at the Bankoku Shinryokan facility in Kise, Nago. The two statues are made of crocidolite from southern Fujian, and were carved in Fujian. They are roughly 160 centimeters tall, and together weigh approximately 3.4 tons. The lion holding a ball represents a wish for peace, and the lion with a cub represents a wish for the thriving of future generations. “I hope the lions watch over the exchange between our two provinces, and bring us good fortune,” said Hong Li, vice director of the Foreign Affairs Office of the Fujian Provincial People’s Government. At the unveiling ceremony, the prefectural government also unveiled shisa and dragon pillars at the facility carved by artist Mitsuo Miyagi.